I arrived in Titusville on a sunny, warm winter's day in January. I was ultimately headed to a NASA Social, but wanted to meet and greet the folks of Titusville first. I'm all about the supporters. The ones who support others to fame. Titusville has supported NASA since the '60s, I wanted to see how NASA treated Titusville. So I spent a few days with her. Driving down Hwy. 50 from I-95, I came across the Prison Book Project. I'm a huge reader, a lover of books. I just had to see what this was all about. "I retired from the Air Force out at the Cape, was doing stuff around the house that my wife wanted me to do including painting the house 4 times (she didn't like the color) and I figured I'd go fishing and she wouldn't see me for 6 months, but God told me to do this and I haven't been fishing since. I'm a top water light tackle bass fisherman, like to get a good fight out of them, but I don't get to do that much anymore. I'm growing kickin' and screamin' 'cause I want to go fishing you know." He pulled his rod and reel out from the back corner, still in its packaging. We went back home, though, and developed a church bulletin insert that we took to around 100 churches. 16 said they'd help and 12 really did. A lot of stuff ended up in boxes I couldn't use so I'd trade them in thrift shops and get Christian books or uplifting books. After 39,886 books, God told me to quit counting back in 1997. I did. I didn't count again for many years, maybe around '06 or '07 my volunteers did a test to get some numbers and we have been counting ever since. 65 books per box. 45 boxes out a day per average. 2,600 books out in one day sometimes, read by an average of 30 people per book. We did a test with This Present Darkness, 65 people read that one issued book. If we have 2600 books read by 30 people, we touched 78,000 people yesterday. The average reading time is 8 hours, so we did 624,000 hours of ministry yesterday, serving all 50 states and 35 countries. Our first operations location was a church. Then we moved into a moose club around 1997 – 2001. We then abandoned the moose club due to leaks and moved into this 4,000 square foot empty lot at a local mall. The mall, owned by a local family farm, is shutting down and we have to be out in February, 2013. Every Wednesday a local church sends about 20 people over to stamp the books with a Prison Book Project stamp. The prisoners that read these books see the stamp and send letters to the Ministry. Inmates were being held as federal prisoners, then get convicted and move to another prison. The books began moving all over the country. If you send one book or bible into a prison to one inmate, you get tons of letters back of people wanting more." Ray claims he reads every letter. 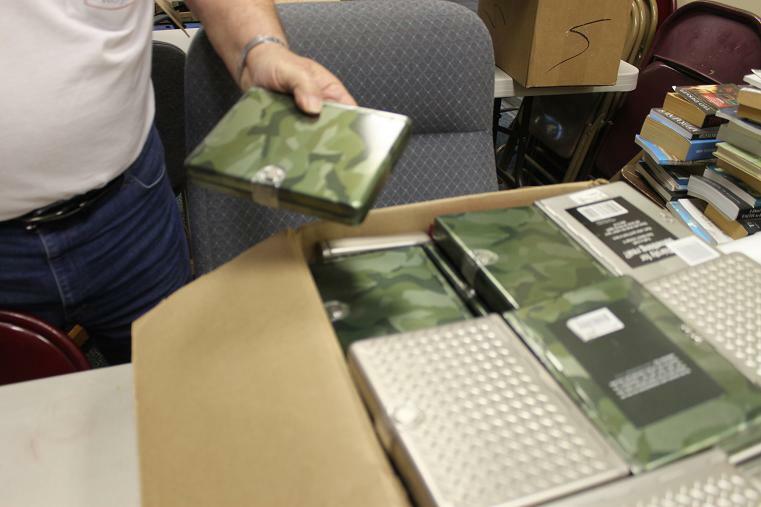 He often hears a plea for a Bible and sends it directly to the inmate. 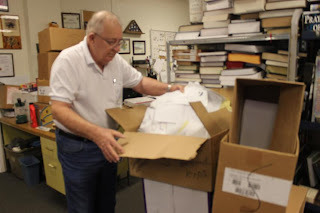 Shipping around the prison chaplain and directly to the inmate avoids a lot of bureaucracy, but shipping directly to the chaplains is much more cost effective. It's quite a dilemma. Back in 2004, Ray's wife was diagnosed with colon cancer and went on chemo which almost killed her. The ER doctor stopped the chemo and kept her 22 days, releasing her with the recommendation she be put in a nursing home. Ray was encouraged by another doctor to go pray. His wife lived over seven years after that -- the best seven years of their time together. They went to Japan, Israel, and went back up to NY where Ray took basic training. "All of a sudden, she had a heart attack, infection came and shut everything down. On April 30th, 2012, she passed away." Ray has continued the Prison Book Project without her, but his grief is clearly evident. "Soon after the ministry began, they started contacting publishers to get Christian books -- Bethany House, Tyndale. Got some books from them, started aggravating another company for Christians westerns. 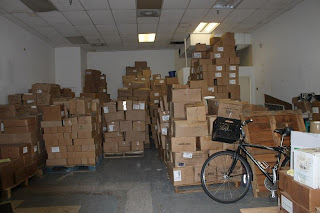 Finally they called, had 5 skids of books but we would have to pay the shipping. More money than I wanted, but I did it. Sent them to every prison in FL. Sent two boxes, didn't have any idea what I was doing and some of these places only had 19 people in jail and some had 2000, ridiculous,. We started getting letters, inmates would write to the companies asking for more copies and companies would forward the letters. We started getting letters from all over." Now there are 950 jails on a waiting list, "We don't have the resources and money to get the books out for a lot of different reasons. We're limited by funding. Figuring about 10 bucks a book, we're doing about 50 million business a year and it's costing us less than 100,000. It seems like God has done great things, has always sent encouragement when I needed it and an abundance of books. 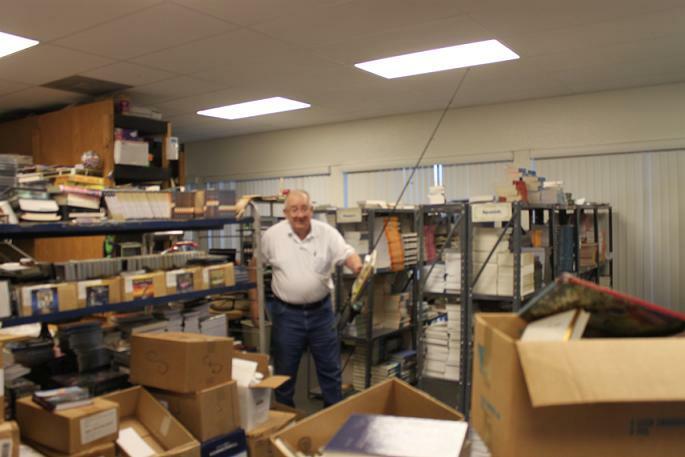 Last year, we had to turn down about 275 skids of books because we didn't have room to store them." Ray moved about the books like a wildman, gesturing and smiling, sipping his coffee. "Everyone of those people, they're human beings." It boggles his mind why he has all these books and not enough money or volunteers to get them out. Now he's looking for his coffee, abandoned on a shelf somewhere. "I'mma put a whistle one day on my coffee cup," He sighs. He has one full-time volunteer. "The day the hospital called me to come over, this guy came by. I was expecting a skid of books to come in. I asked him to unload the skid cause I had to go to the hospital (wife), and he has been with me ever since. He's my only full time volunteer. No pay. I have two others, part time. One is a bookkeeper, another writes the thank you letters, mails them out, and tries to get grants. Nobody wants to help prisoners. We're not getting any grants. We need a grant writer." "I'm committed to the Brevard County Jail -- to take 50% christian and 50% non-Christian, but non-Christian has to be constructive in nature – clean westerns where the good guy wins and the bad guy doesn't, ones that have moral lessons and standards. To the rest of the world, all I send is Christian stuff." Ray physically sends newsletters to about 2300 people -- snail mail. He doesn't do email yet, but his newsletter is online on his website PrisonBookProject.com. Donate here. How you can help with time and resources.